GEDA manufactures rack and pinion elevators for the power industry. GEDA’s state-of-the-art industrial rack and pinion elevators have been specially designed for the power generation industry, where there is a growing need for safe, reliable vertical transportation for personnel and material. GEDA offers several elevator options to meet the service requirements of the power generation industry, including boilers, chimneys, flue-gas desulfurisation (FGD), silicon-controlled rectifier (SCR), transfer towers, crusher buildings, fly ash silos and precipitators. Specifically developed for industrial applications, GEDA rack and pinion elevators meet the maximum height transportation requirements, even in adverse environmental conditions such as in potentially explosive areas, contact with dust and heavy loads in frequency, and suspended load or extreme climate conditions. In addition to the GEDA standard rack and pinion elevator portfolio, the company also manufactures customised solutions. With hoisting speeds adjustable to requirements of 24m to 60m/min, load capacities from 300kg to 3,200kg, and hoisting heights of up to 200m, GEDA rack and pinion elevators ensure secure and efficient transportation. The elevators can be used within temperature ranges of -42°C to 75°C. Extensive options for platform sizes and load capacities are also available, making GEDA products suitable for a wide range of applications. Industrial elevators create significant time and cost savings due to efficient workflows in maintenance and service work. In comparison to traditional wire rope elevators, when deploying a GEDA rack and pinion elevator for industrial use, a closed shaft or machine room is no longer required. The device is assembled quickly and cost-effectively. The rack and pinion elevators from the GEDA industrial elevator range are suitable for both indoor and outdoor use. Drawing on its decades-long experience and with successful deployments worldwide, GEDA supports its partners during the entire project. In addition, the project is subject to a professional documentation system. GEDA is certified by international testing bodies and its industrial elevators comply with ATEX (ATEX Product Directive 94/9/EC, ATEX Worker Protection Directive 1999/92/EC) and certification standards defined by the NEC and IEC for temperature-resistance, temperature classes and explosion protection guidelines if required. Only the highest-quality EX components from leading manufacturers are used, and all load-bearing components are batch managed. GEDA meets or exceeds the requirements of global EPCs. GEDA products comply with general industrial specifications and can be certified in accordance with ANSI A17.1 and EN-81. The entire company has been tested and certified according to the ISO 9001: 2008 quality standard and GEDA’s environmental management system and occupational health and safety system meet all the specifications of the internationally recognised standards DIN EN ISO 14001 (environment) and OHSAS 18001 (occupational health and safety). As an innovative mechanical engineering company, GEDA is a member of the VDMA (German Engineering Federation). For nearly 90 years, GEDA has been combining experience with continuous further development, proven quality and longevity in height access technology issues. As part of its comprehensive support approach, the company provides solutions and acts as a reliable partner of the customer, from the initial enquiry up to the maintenance and servicing contract. GEDA also provides support during installation and additional acceptance tests on-site, customised in-service training sessions, a quick replacement parts and repair service, as well as maintenance agreements with either GEDA or global service partners. Bavarian company GEDA has provided industrial hoists to aid the steel construction of a dual feed cracker at a petrochemical complex being built since 2009 by ONCG Petro Additions Limited (OPaL). 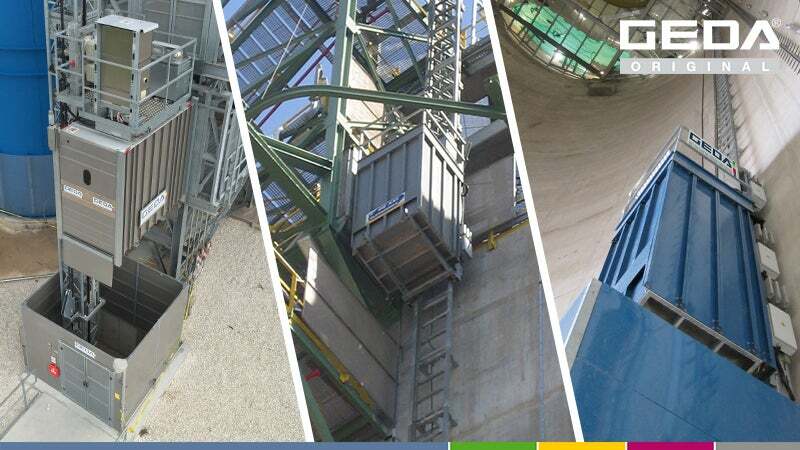 GEDA-Dechentreiter GmbH and Co KG has delivered two industrial lifts to a preheater tower on a multi-chamber silo based at Märker's cement facility in Harburg, Germany. Four GEDA SH 400 EX service hoists are in permanent use at the LNG Import Terminal at the port of Sagunto, in the Province of Valencia, Spain.